Delicious though they may be some granolas are more like dessert than breakfast cereal. This version is lighter but no less delicious meaning you can enjoy it everyday! The apple sauce makes up for much of the oil and sugar that is added to other granolas. 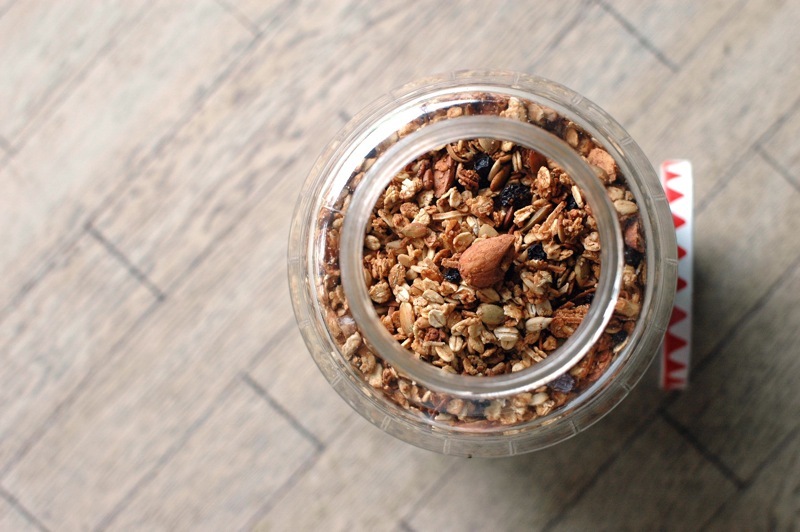 The best thing about granola recipes is that they can be altered to suit your tastes and/or what you have in the cupboard. This recipe uses barley flakes which give a lovely crunch, but you could add other rolled cereals instead or 100 % oats. Try different spices (nutmeg, ginger, cardamom), sweet syrups like agave and maple or experiment with different combinations of nuts, seeds and fruits. In a small saucepan stir honey, apple sauce and safflower oil over a low heat until combined. Allow to cool a bit then stir in cinnamon, vanilla and salt. In a large bowl mix the remaining ingredients together. Add the honey mixture and use a big spoon (or your hands) to thoroughly combine. Spread granola, in an even layer, over two baking trays. Pop both trays in the oven and bake for between 30 and 45 minutes, gently stirring every 10 minutes without fail. 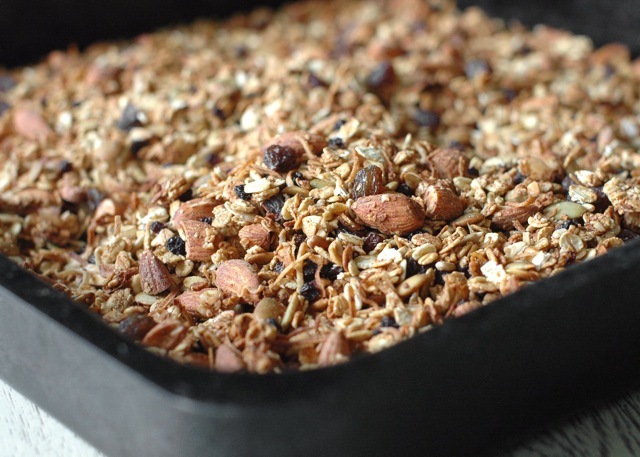 When the granola is crunchy, toffee-coloured and irresistible smelling it’s ready. Cool completely in trays before adding dried fruit and storing in a tightly sealed container.